Winter is when the region transforms into a white wonderland. From December until April, incredible amounts of snow fall in the area. 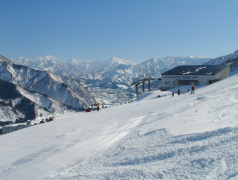 As well as the popular Ishichi Maruyama ski and snowboard resort, there are over 20 other ski and snowboard resorts in the region - making the area one of the most popular snow resort regions of Japan. Summer is generally hot in Japan, but the Ishiuchi Maruyama region experiences more comfortable conditions. Summer is a good time for hiking and other outdoor activities. In autumn the leaves on the trees change color to give us some fantastic multicolour "koyou" views. It truly is a great time to be in the area - don't forget your camera! Autumn is also the time when you will see locals busy preparing for the winter season. This very interesting temple is located in peaceful surroundings just to the north of the Ishiuchi Maruyama area. A visit to Untoan is highly recommended if you are in the area. This temple, located nearby in Ishiuchi Maruyama, has a 600 year history. Located just off Route 17, Izumi Museum presents exhibits from Papau New Guinea and also over 160 other countries including a collection of rare masks and dolls. This museum presents an interesting collection of wood art. It is located near the Shiozawa Ishiuchi IC on the road towards Ishiuchi Maruyama. Visible from Ishiuchi Maruyama, this mountain is known by some as the "Fuji-san" of the region. Hiking courses, including those for beginners, can be found around the mountain area. The road that spans the mountain from Ishiuchi Maruyama to Muikamachi is known as "Uonuma Skyline" and on clear days provides spectacular views of the region. Due to snow, the road is closed in the winter months. Daigenta Canyon is located in neighbouring Yuzawa Town and is a beautiful area surrounded by spectacular scenery and complete with a peaceful lake and hiking courses. Shakunage Lake and the Sagurigawa Dam make for a great drive with spectacular scenery. There are also many hiking courses in the region. The Hakkai-san ropeway takes you up to 1147 meters and from there you can either take in the views or make your way to the summit for an interesting climb and even more spectacular views. 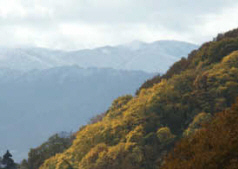 One of the "100 famous mountains of Japan", Makihata is a beautiful mountain. If you make your way to the top, you'll be rewarded with amazing views of the surrounding regions. This popular summer family attraction at Joetsu Kokusai features water slides, a water bobsleigh, "Wild River" and other fun attractions. The biggest resort close to the Kanetsu expressway and Joetsu Shinkansen, Ishiuchi Maruyama has courses for everyone from young children to experienced skiers and snowboarders. Check out the 4 park areas complete with half pipe, superpipe, jump, kicker and more fun attractions. The Ishiuchi Maruyama Ski Festival is held each year in March. This season major ski and snowboard manufacturers will be bringing new equipment for testing, and special lessons with top skiers are planned. 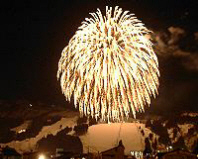 As always there will be a spectacular firework display as well as lots of other fun events and attractions.